Astronomers have found a unique object that appears to be made of inner Solar System material from the time of Earth’s formation, which has been preserved in the Oort Cloud for billions of years. Originally identified by the University of Hawaiʻi’s Pan-STARRS1 telescope, C/2014 S3 (PANSTARRS) is a weakly active comet a little over twice as far from the Sun as the Earth. 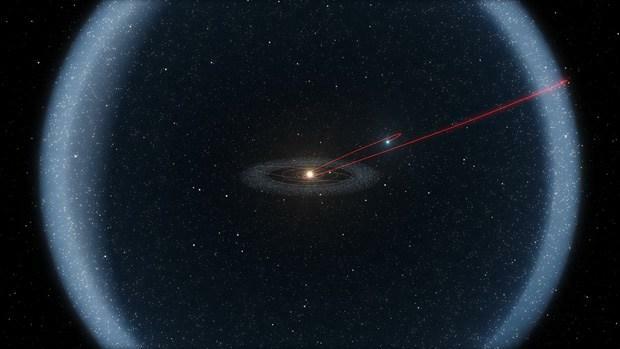 Its current long orbital period (around 860 years) suggests that its source is in the Oort Cloud, and it was nudged comparatively recently into an orbit that brings it closer to the Sun. Follow-up observations with ESO’s Very Large Telescope and the Canada France Hawaiʻi Telescope show that C/2014 S3 (PANSTARRS) is the first object to be discovered on a long-period cometary orbit that has the characteristics of a pristine inner Solar System asteroid. 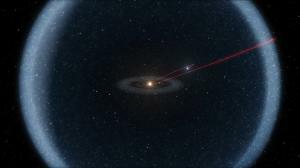 It may provide important clues about how the Solar System formed. In a paper published today in the journal Science Advances, lead author Karen Meech of the UH Institute for Astronomy and her colleagues conclude that C/2014 S3 (PANSTARRS) formed in the inner Solar System at the same as the Earth itself, but was ejected early in the planet formation process. Their observations suggest that it is truly an ancient rocky body, not a more recently created asteroid that wandered out. It was a potential building block of the rocky planets like Earth, but was expelled from the inner Solar System and preserved in the deep freeze of the Oort Cloud for billions of years. The team immediately noticed that C/2014 S3 (PANSTARRS) was unusual, missing the characteristic tail that most long-period comets sprout as they approach so close to the Sun. They dubbed it a Manx comet, after the similarly tailless cat. Within weeks of its discovery, the team obtained spectra of the very faint object with ESO’s Very Large Telescope in Chile. Careful study of the light reflected by C/2014 S3 (PANSTARRS) indicates that it is typical of “S-type” asteroids, which are usually found in the inner asteroid main belt. It does not look like typical comets, which are believed to form in the outer Solar System and are icy, rather than rocky. This comet’s material has undergone very little processing, indicating that it has been deep frozen for a very long time. The very weak comet-like activity associated with C/2014 S3 (PANSTARRS), which is consistent with the vaporization of water ice, is about a million times lower than active long-period comets at a similar distance from the Sun. A number of theoretical models are able to reproduce much of the structure we see in the Solar System. An important difference between these models is what they predict about the objects that make up the Oort Cloud. Different models predict significantly different ratios of icy to rocky objects. This first discovery of a rocky object from the Oort Cloud is therefore an important test of the different predictions of the models. The authors estimate that observations of 50–100 of these Manx comets are needed to distinguish between the current models, opening up another rich vein in the study of the origins of our Solar System. About 15 are being discovered each year -- most of them by Pan-STARRS -- so this goal is within reach. This research was presented in a paper, titled “Inner Solar System Material Discovered in the Oort Cloud," by Karen Meech et al., in the journal Science Advances. The team is composed of Karen J. Meech (Institute for Astronomy, UH, USA), Bin Yang (ESO, Santiago, Chile), Jan Kleyna (Institute for Astronomy, UH, USA), Olivier R. Hainaut (ESO, Garching, Germany), Svetlana Berdyugina (Institute for Astronomy, UH, USA; Kiepenheuer Institut für Sonnenphysik, Freiburg, Germany), Jacqueline V. Keane (Institute for Astronomy, UH, USA), Marco Micheli (ESA, Frascati, Italy), Alessandro Morbidelli (Université de Nice Sophia-Antipolis, Nice, France) and Richard J. Wainscoat (Institute for Astronomy, UH, USA). Founded in 1967, the Institute for Astronomy at the University of Hawaiʻi at Mānoa conducts research into galaxies, cosmology, stars, planets, and the sun. Its faculty and staff are also involved in astronomy education, deep space missions, and in the development and management of the observatories on Haleakala and Maunakea. The Institute operates facilities on the islands of Oʻahu, Maui and Hawaiʻi.